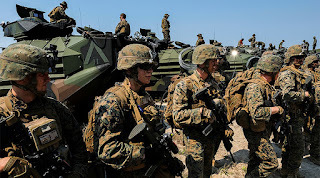 When the global military empire takes money from programs that poor people depend on and gives it to rich military contractors - it is a theft and looting of the national budget, says Brian Becker, the National Coordinator of the ANSWER Coalition. Donald Trump's administration has announced that it is seeking to boost military spending by 10 per cent in 2018. The American military budget already exceeds any other country's by far and could be set for a historic boost. According to US President Trump, the aim is to "reform" the US military so that it can operate more effectively. Many analysts believe, however, that the proposed boost would hurt other American sectors, not to mention slash already starved public programs. Others suggest the move might even provoke a global arms race. RT: What do you make of the proposal to give defense spending a historic boost? The amount that he is proposing to increase - $54 billion - is just a little bit less than what Russia spends every year on its military. In other words, this is an unnecessary expenditure increase of an already bloated US military machine. Trump says “we have to start winning wars again”. And the fact of the matter is that the US should stop waging wars that it needs to win but can’t win. Korea, Vietnam, Iraq, Afghanistan - the problem with these wars are not that they weren’t won, the problem is that they were waged in the first place because they were wars of aggression. It is going in the wrong direction. RT: Will it come at the expense of other sectors? BB: It has to, because the defense budget is part of what is called the “discretionary budget”. Entitlements like Medicare and Social Security – those are exempt from the national budget. When Congress approves a budget every year, that is the discretionary budget. How much will be spent on defense. How much will be spent on education, on housing, on transportation, on the environment. 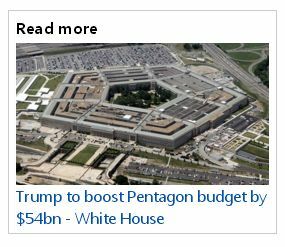 When you increase the discretionary budget, the part of the discretionary budget for the Pentagon, for war by $54 billion - 10 percent - that means the money has to come from housing, from education, from environmental protections. This is kind of our Robin Hood in reverse: taking money from programs that poor people and working class people depend on and giving it to military contractors who are already rich. It is transference of wealth from the bottom to the top. It is a form of theft and looting of the national budget all in the name of making the American military great again. It is already great. The problem is it is too big already. It should be cut; it should be seriously reduced because this kind of military spending incentivizes new wars. RT:Could the planned spending hike ignite a global arms race? BB: Yes, it will because who are these new high-tech weapon systems going to be directed against? They will be directed against Russia, they will be directed against China. They are going to be directed against emerging powers that somehow provide an obstacle to complete US hegemony in key geostrategic or resource-rich parts of the world. What will Russia and China do in the face of a growing military expenditure, they must take counter-measures. Because of course, Russia feels NATO has expanded to the East. China feels that the US has taken the South China Sea and pretend that it is an American lake. So, yes, this will be a global arms race. Nobody wins that race.